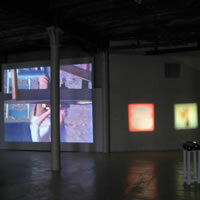 This small exhibition consists of three projections, all based on original artworks. 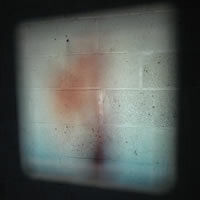 The largest makes use of a Bill Viola video from 1979-81 titled Ancient of Days, which Triple Candie purchased four years ago. 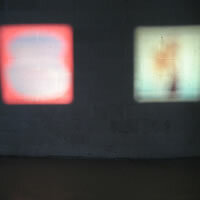 It is an early example of the artist's ground-breaking technical experiments with the medium. Here he almost seemlessly incorporates multiple images within a single frame to explore various notions of time. The Viola project is shown upside-down. 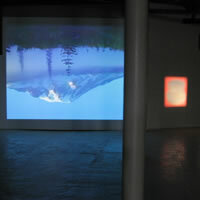 The two other projections are from 35mm slides and paintings by Robin Dash and Joan Nelson. 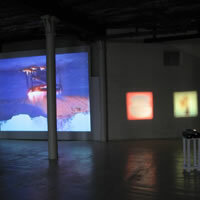 The Dash slide was included in a slide submission from the artist to Triple Candie several years ago. The Neson slide was acquired by Triple Candie from the artist's gallery in 2001 while Triple Candie was conducting research for an xhibition that never happened. These two slides are presented out of focus. 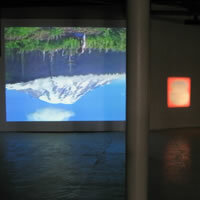 The exhibition cost $11.50 to produce. The wood -- used to build the screen, slide-projector stands, and wall barriers -- and the white paint are from Triple Candie's storage room. The equipment is either owned by Triple Candie or borrowed. The only purchases were a paintbrush, a roller head, and a spool of galvanized wire. 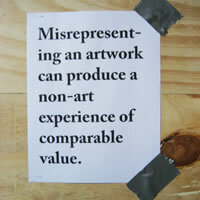 Misrepresenting an artwork can produce a non-art experience of comparable value.